But, it is facing troubling times and requires strong, visionary and knowledgeable leadership to regain a place of respect within its member states and the international community. If it fails to do so, the Commonwealth will limp into oblivion and the greatest losers will be its 31 small member states – 12 of which are in the Caribbean. The importance of the Commonwealth to small states lies primarily in the access its Summit meetings give leaders of these small countries to leaders of some of the world’s major powers on an equal basis. No other international or multilateral organisation affords such an opportunity. The ‘retreat’ of Heads of Government at their meetings is a particularly beneficial mechanism if it is used as it was intended. When the idea of the ‘retreat’ was presented in 1973 by then Prime Minister of Canada, Pierre Trudeau, its purpose was to gather Heads of Government – along with only the Secretary-General - for a ‘no-holds-barred’ discussion on issues within the Commonwealth and the global community. There were no Ministers or officials present. Consequently, leaders could speak openly and frankly to each other and what came out of the ‘retreat’ was far better understanding and much greater commitment to a shared agenda. Often frank talk with leaders whose policies bordered on violating Commonwealth values served to pull them from the brink or to encourage their departure from the ‘Club’ if their offending policies persisted. Regrettably, since 2005 when Ministers and officials began to participate in Heads of Government Conferences and ‘retreats’, the value and importance of the ‘retreats’ particularly have been severely eroded. The measure of the erosion is the continuous decline in the number of Heads of Government who attend the meetings or go to the ‘retreat’. Heads of Government have made it clear that they do not travel long distances to attend what is billed as a ‘Heads of Government Meeting’ to talk to Minister and High Commissioners. At the ‘retreat’ in Sri Lanka in November 2013, less than 20 Heads of Government were in the room, hence no frank and personal discussions took place and the objective of consensus - built on understanding and appreciation - was lost as was the worth of what came out of the meeting. Small states cannot afford the devaluation of meetings of Heads of Government, particularly at the ‘retreat’. Their battles in the International Monetary Fund, the World Bank, the World Trade Organisation and in the G20 are much more effectively fought with the support of larger and stronger countries. That’s why frank and persuasive conversations in the ‘retreat’ are vital to small states. When the Prime Ministers of Britain, Canada, Australia, India and South Africa (all G20 members) have a deeper appreciation of challenges facing small states and are willing to champion them, the interests of small states have a much better chance of being advanced. 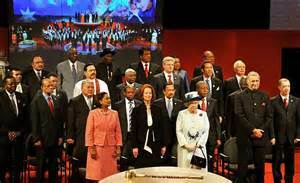 Commonwealth Heads of Government should give that leadership. They meet again in Malta in November 2015, but ahead of the Summit it would be beneficial for a preparatory meeting of Heads of Government – one Head from each region – to recommend how best to make the Commonwealth meaningful to its members and relevant to the conduct of international relations in the 21st Century. In January at a Conference on the Commonwealth I had suggested that such a meeting be convened under the Chairmanship of the Maltese Prime Minister. One thing is for sure - if the Commonwealth goes, its small member states will lose their most important advocate. None of them can afford the loss.